This week in Marine Corps history the USS Iwo Jima was decommissioned and the 4th Marine brigade fought in the Battle of Soissons in France in World War I. Learn more in our first article. 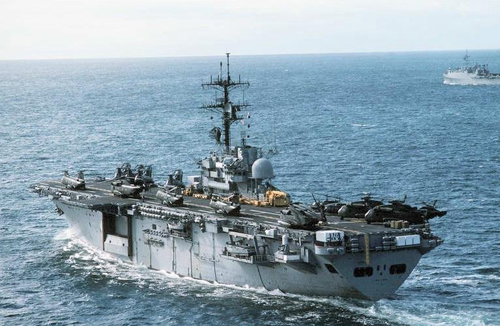 Twenty-two years ago this week, on July 14, 1993, the USS Iwo Jima was decommissioned after more than 30 years of service. The decommissioning took place in a ceremony at Norfolk Naval Base, Virginia. The ship had been named for the World War II battle during which three Marine divisions battled, and defeated, 20,000 Japanese troops. The ship had been commissioned in August 1961, and it was the first ship specifically designed to serve as an amphibious assault ship. In WWI, the 4th Marine Brigade earned the title of "Devil Dogs" for heroic actions at Belleau Wood, Soissons, St. Michiel, Blanc Mont, and in the final Meuse-Argonne offensive. Ninety-seven years ago this week, on July 18, 1918, the 4th Marine Brigade began an attack near Soissons, France. 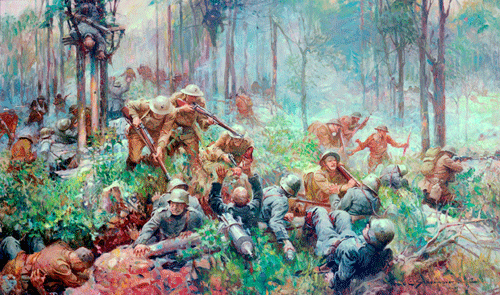 The attack was part of a World War I three-division counterattack against German forces. The Marines sustained 1,972 casualties in the first two days of the battle. 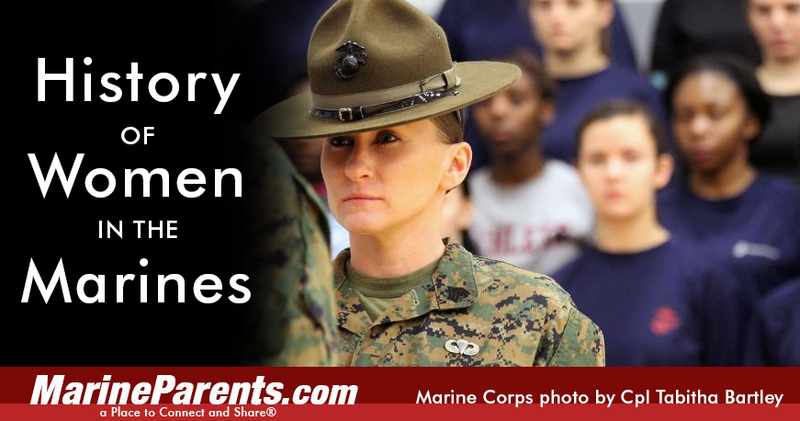 Just over a year after the United States entered World War II, the United States Marine Corps authorized a Women's Reserve, becoming the last of the services to open its ranks to both genders. When publicly announced in February 1943, the Marines had a goal of 1,000 female officers and 18,000 enlisted volunteers, and by the end of the war in 1945, there were 820 officers and 17,640 enlisted female Marines. These women served in non-combat roles, mainly in clerical positions, although some were parachute riggers, mechanics, radio operators, welders and more - and none served farther west than Pearl Harbor. Then-Marine Corps commandant General Alexander Vandegrift said the presence of female Marines made it possible for the 6th Marine Division to be put to the field. Sgt Stevie Cardona, drill instructor, Oscar Company, 4th Recruit Training Battalion, MCRD Parris Island, receives her Letter of Appreciation from Maj. Charles C. Nash, commanding officer, Marine Corps Recruiting Station Columbia for participating in the semiannual Female Pool Function at Fort Jackson Army Base on Jan. 24, 2015. Cardona came down from Parris Island to give the females a brief preview of what training would be like and to help prepare them to earn the title of United States Marines. Our wounded, ill, and injured warriors have sacrificed so much while serving our nation. Now it's our turn to serve them. Help us set the dinner table to help begin the healing. Make your donation today. 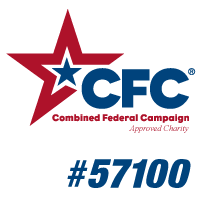 Our goal is $12,000 by August 1, 2015 to continue serving meals at military medical facilities June through August this summer. "A very common thing I've heard over the past few months at the dinners from the wounded guys is that the dinners give them a reason to leave their rooms or homes. Even if they're having a bad day, seeing familiar faces and eating with people they know care about them helps the wounded feel less isolated...Having a meal to count on each week really does make a difference and relieves some stress for the guys. It also gives them the opportunity to sit and interact with other wounded warriors, as opposed to keeping to themselves." -- Paige, Warrior Support Team--West Volunteer and wife of a recovering warrior. 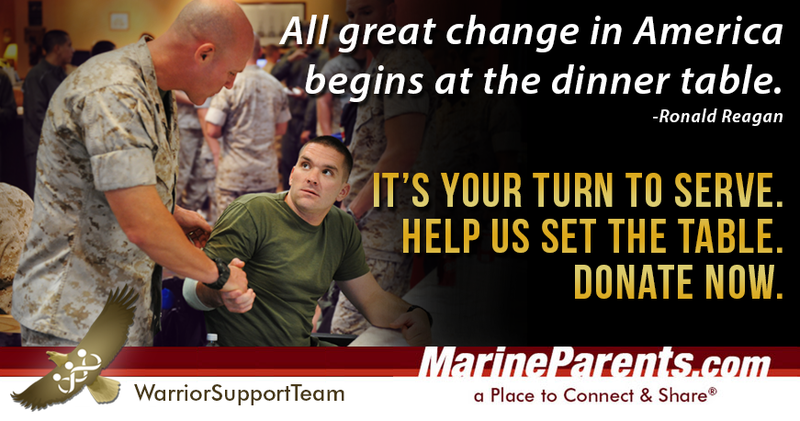 While serving dinners may seem like a small thing, they are loved by the men and women who attend them. The dinners let the recovering warriors know that America remembers them; that their sacrifices are appreciated; that they aren't alone. The relationships formed at these dinner tables can be the starting point for the service member to work with the Warrior Support Team during their upcoming reintegration to a civilian lifestyle. And we need your help to ensure that they continue. 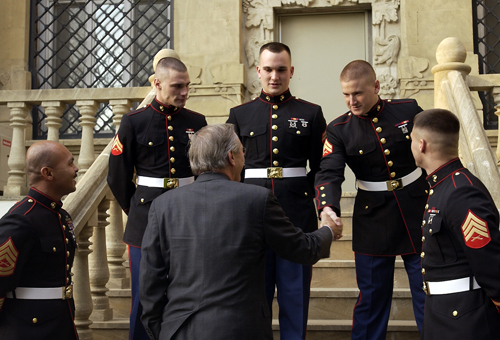 Then-Secretary of Defense Donald H. Rumsfeld shakes hands with U.S. Marines stationed at the U.S. Embassy in Baku, Azerbaijan, in 2003. Earlier this month, the U.S. State Department announced its intentions to open an embassy in Havana, Cuba, bringing the Marine Corps a step closer to deploying its iconic embassy guards to the island nation for the first time since 1961. This marks a significant step in reestablishing formal diplomatic ties between the two countries after more than five decades of strained relations. According to Marine officials,the Havana detachment will consist of between six and 20 Marines, likely on the lower end of that spectrum, as Havana is assumed to be a low-risk post. While U.S. officials have not given a specific date for when this will be taking place, officials from Cuba's Foreign Ministry have said that embassies will be up and running in both countries on July 20. Master Gunnery Sgt. 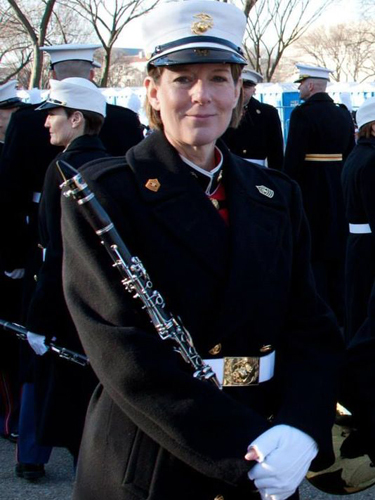 Ruth McDonald, who plays the clarinet in "The President's Own," joined the Marine Band on Oct. 4, 1985. Last Thursday, July 10, saw the retirement of the longest-serving female member of the Marine Corps band, also known as "The President's Own." Master Gunnery Sergeant Ruth McDonald began playing the clarinet in third grade, graduated from Ithaca College with a bachelor's degree in music, and had just earned a master's degree from the New England Conservatory when she auditioned for the band in 1985 after seeing an advertisement in the musician's union paper. At the time of McDonald's audition, it had only been 12 years since the first woman had joined the Marine Corps Band, and there there were still no locker rooms or uniforms specifically for women. However, over the course of her 30-year career, McDonald played a vital role in increasing the comfort and presence of women in "The President's Own." According to Major Michelle Rakers, "It's going to be a big loss when we see Ruth retire. She has shouldered the burden of transition when women just came into this organization." 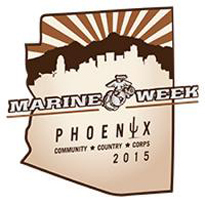 This fall, the United States Marine Corps will be celebrating, "Community, country, and Corps" September 10-13 in the Phoenix area during Marine Week 2015. Activities during the week will include concerts, the showcasing of equipment and aircraft, such as the MV-22 Osprey and AH-1Z Super Cobra, and community service events. The full schedule of events will be available this summer and be sure to check out the photos and videos of Marine Week Phoenix. 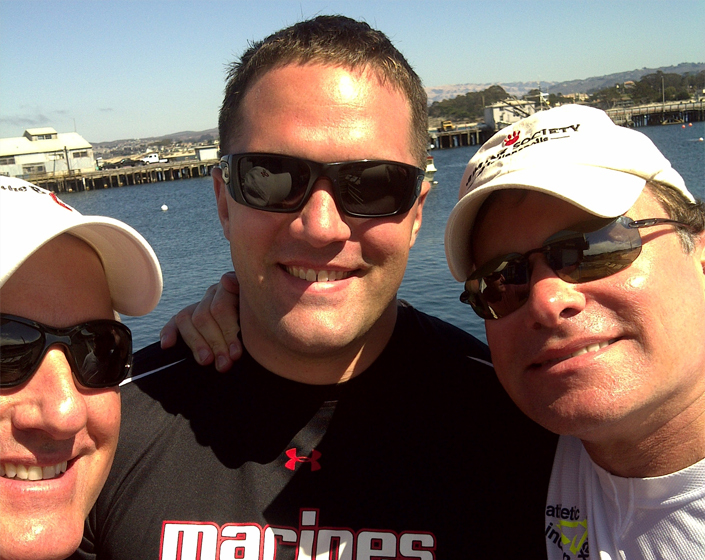 This month's TMP featured participant is a proud Marine father--Mark Waddell. In addition to being a Marine father, Mark served as a Mustang Officer in the U.S. Navy SEALs and retired after 25 years of military service. Mark's son, Joshua, has served two combat tours and has earned a Master's Degree from the Naval Postgraduate School. Joshua has also completed two Marine Corps Marathons, and will be pacing his father this year. Mark is still working toward his goal of raising $500, but with your support and generosity we know he can get there in no time! Thanks for being a part of the team, Mark, and we look forward to seeing you in Washington! 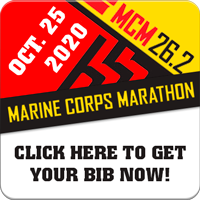 Do you want to run in this year's Marine Corps Marathon (MCM) but missed your chance to get a bib during this year's MCM registration lottery? 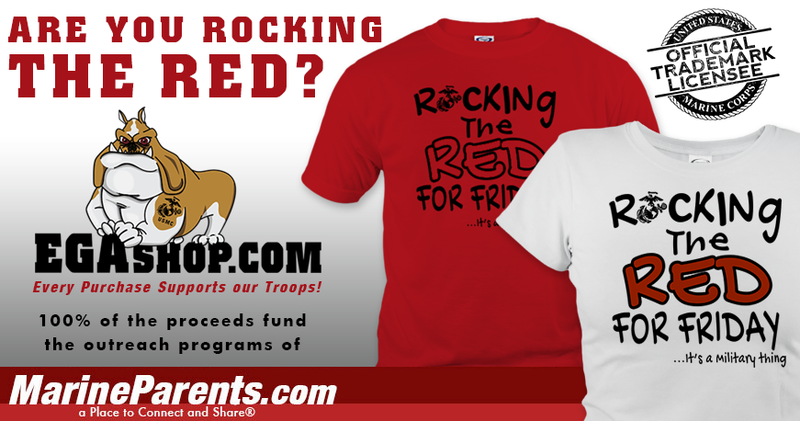 Don't worry, Team Marine Parents (TMP) has your back! 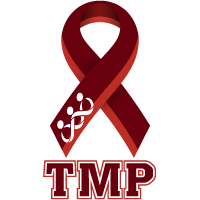 As an official MCM Charity Partner, TMP has bibs available for those who want to run in the marathon, all you have to do is join the team! 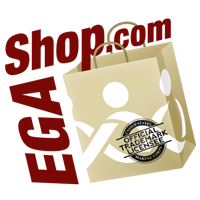 TMP currently has 15 bibs remaining for this year's race. Each bib costs $130 (a $125 registration fee and a $5 processing fee) and runners must pledge to raise at least $500 for a MarineParents.com outreach program of their choice in return for receiving their bib. Joining TMP is a great way to get in shape while raising money for a good cause and these bibs won't last long! Don't miss out on your chance to run in the 2015 MCM, join TMP today! Click here to get your bib today! 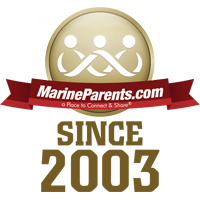 MarineParents.com, Inc. is an IRS-approved 501(c)(3) public charity founded on January 21, 2003 to provide support, information, and services to Marines and their family members, and to create opportunities for individuals to support our troops. 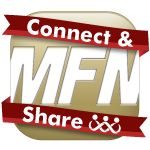 In over 12 years of service, Marine Parents has made a huge impact in support of Marines, military personnel, and their family members.